A slot about a band of ape musicians sounds like something dreamt up by Alan Partridge to accompany Monkey Tennis. It’s just the theme you’ll find in Banana Rock though, a 5 reel, 10 payline video slot from Play ’N Go. Highlights of this gig include re-spins with wandering wilds, free spins followed by a final encore spin where you can boost the payout with multipliers of up to 25x. Play on your PC, tablet or mobile from between 10p and £100 per spin. The design in this anarchic video slot is rather good. You’ll see jungle foliage and giant speakers behind the reels. On those reels are neon A to J playing cards as well as the 5 members of the band Banana Rock. In order of value are the percussionist, keyboard player, double bassist and drummer. Land 3, 4 or 5 of the guitarist on a payline and you’ll receive an award of 5, 10 or 40 times your total bet. Helping move things along are the pair of wilds. Both the gold disc and the lead singer replace everything bar the Banana Rock logo which is the scatter. Land 5 of these on a payline and you’ll receive a 40 times bet payout. Wilds are central to the game’s 3 bonus features. Rock ‘N’ Rollin’ Re-Spin feature – land 2 of the lead singer wild and you’ll be awarded a series of re-spins. On each 1, the right most wild moves towards the left most wild. It can move up and down to link with other wilds to create a wild trail with potentially explosive results. Free Spins feature – 10 free spins are awarded if you land the scatter on reels 1 and 5 on the same spin. Each scatter that hits during the feature adds another free spin to your tally. Landing full stacks of band members fills a multiplier meter which can apply a multiplier up to 5x for each of the band members. You can also trigger the Rock ‘N’ Rollin’ Re-Spin feature during the free spins feature. After the free spins takes place, you will enter the Encore Spin feature – all the collected multipliers are combined and applied to whatever you win on that encore spin. Get lucky here and you could receive a massive 25x boost. 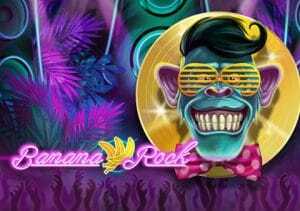 The simian theme here might be supremely silly but Banana Rock can deliver some serious action, especially once the features come into play. The is a volatile game with maximum payouts of 2,500 times your bet on each Encore Spin (with the 25x multiplier). We enjoyed the anarchic Banana Rock. Yes, it’s daft but it can deliver some pretty good action though. If you fancy a high variance video slot, then this is a gig you won’t want to miss. If music if your thing, IGT’s Shamrockers Eire to Rock and NetEnt’s Jimi Hendrix are worth playing.